A game changing masterpiece of contemporary German Hip Hop. Featuring the finest underground artists from Detroit. There is no doubt that Meni and Deve are two of the most talented and recognized underground artists in the German Hip Hop movement. Both fans and critics have been awaiting their new release desperately. It has been four years now since the two likeable gentlemen introduced their album “Was Größeres (Something Bigger)”. One might remember the hit single “Stuttgart Hymne” which conquered web charts, went viral and got broadcasted anywhere from local radio stations up to MTV TRL. Now Meni and Deve are back - finally, luckily, terrifically! The two artists and Philwa, their long standing companion, live DJ and producer, most certainly overdid themselves with their latest release: unique and heart-warming soul beats, ingenious rhymes, brilliantly fermenting thoughts as well as outstanding feature artists from Detroit elevate this record beyond the shadow of a doubt. Five enjoyable high-level tracks, each easily worth to lift a single, make this record a must-have for your personal music collection. 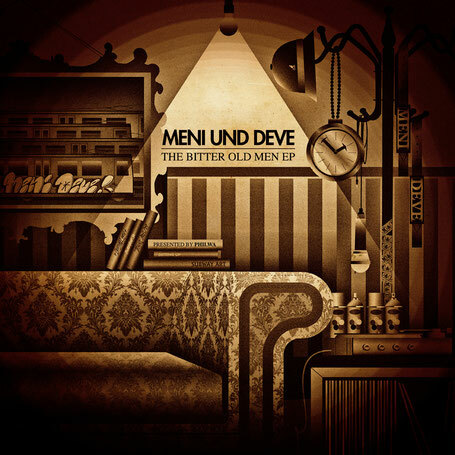 The almost ironic title “The Bitter Old Men EP” gives a wink to the laid-back perception of Meni and Deve about themselves and their old-school image. However, you may be surprised how refreshing old-school Hip Hop can sound in 2014 - judge for yourselves!